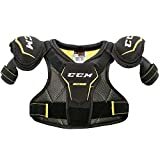 Youth hockey shoulder pads are, in essence, an essential part of hockey gear that is a must-have for the youngest players. We all know that hockey is not a smooth sport, and injuries are bound to happen from time to time. In order to prevent this from happening, we've reviewed some of the best pads, so that your children will be safe from harm. In essence, this is a Bauer product, so it can't be wrong, no matter how you look at it. The Youth Supreme 150 shoulder pads feature exquisite molded foam pads that are able to provide decent overall protection against lacerations, cuts, bruises, and impact, in general. All in all, this shoulder pad set boasts quite a value for the cash. Frankly, there are no major flaws apart from the sizing. This shoulder pad set is a bit smaller when compared to standard youth hockey shoulder pads. First of all, Bauer's Supreme Total One MX3 shoulder pads are one of the best hockey shoulder pad sets on the market. Why is that? They offer absolute protection and the most exquisite features for a low price. On top of that, these shoulder pads won't hinder your mobility, as they're pretty lightweight. In summary, Bauer Supreme Total One MX3 pads hold a good overall value for the cash. Bauer's Vapor was made for “little rookies”, which is also the reason why it got such a name. This model offers great mobility and it features a beautiful design, but, sadly, it doesn't offer as much protection. Anyhow, it's quite affordable, and it boasts quite a value for the cash. In essence, you won't find better youth hockey shoulder pads then CCM RBZ. These pads are made of premium-quality materials, they feature superior overall protection, and they're practically weightless. However, this is a reason why they feel so bulky when worn. Nevertheless, they boast a great overall value for the price. Simply put, CCM Ultra tacks are one of the best hockey shoulder pads that money can buy. Sadly, they're not as affordable, but they offer superior protection and ensure proper anatomical fit. As for the overall value, they're more than worth your cash due to premium-quality features and the exquisite design. Simply put, CCM is incapable of making a bad product. The U + 04 youth shoulder pads are one of their finest budget variants, as they boast great protection and mobility. These shoulder pads belong to the “cheap” price point category, which is one of the main reasons why they hold a great overall value for the money. Even though Brine isn't as famous as Bauer and CCM, they're more than capable of going toe to toe with them. Let me tell you, LoPro Prodigy Lacrosse shoulder pads are extremely good at protecting the youngest players from impact and lacerations. In conclusion, Brine's shoulder pads are decently affordable and well worth the cash. Essentially, CCM's QuickLite 230 hockey shoulder pads are moderately priced, high-performance pads for youth players. Simply put, they are able to guard your young ones against hockey hazards during their plays. All in all, these pads hold a great overall value. First of all, Itech's Lil Rookie Shoulder pads offer great protection and ideal level of comfort. Secondly, these pads are not too expensive. Now, the only bad part is that the size of these pads might not be able to accommodate larger kids. Anyhow, Lil rookie will be able to shield your youngsters from any harm with ease. Great overall value for the price. Without going into too much detail, we can just say that CCM tacks 3092 are the perfect hockey shoulder pads. Plainly speaking, these pads offer superior protection, they're very affordable, and your kid will be able to reap the benefits of absolute fit. Overall, you'll have a really hard time finding a better shoulder pad set in the price range. There's our list! If you need other youth gear, consider checking out our post the best youth hockey pants!